"Trusted Contacts" are friends, family members, counselors, or anyone else the notOK™ user feels they can trust and count on. It is an honor and a huge responsibility, but nothing you can't handle. We firmly believe in Mental Health First Aid and suggest everyone take a class to better identify and assist when people are experiencing a mental health crisis. Check here for classes in your area. When you are first added as a trusted contact, you will receive a text message along with a link to our secure website. This is where you can accept or decline being a trusted contact. This person trusts you enough to show some vulnerability and transparency, be honest and upfront with them about your comfort level with this responsibility. Consider downloading the notOK App™ for yourself, everyone can use a little extra support. 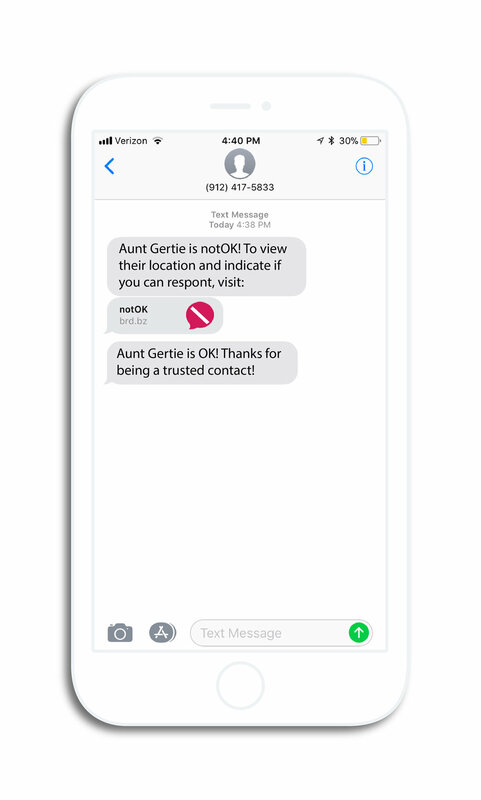 When the notOK™ User needs support and activates the in-app button, a text message is immediately generated and sent to you, the trusted contact. The link will take you to our secure website where you can indicate whether or not you are able to respond to the User's request. Immediately call, text message, or use the GPS location, map, and directions to check up on the notOK™ User. Be an ear to listen, a shoulder to cry on, or arms to offer a hug. When the situation has been resolved or addressed, the notOK™ User will let their trusted contacts know they are OK.
You may want to still check up on the user, just to let them know you are there for them. Send a follow up text or phone call. Smile, knowing you were there for someone who trusts you.